Around the world, swimming pool and spa facilities welcome dozens, even hundreds of people on a daily basis. A basic necessity of pool water treatment is to maintain the water in a safe and pleasant condition for the bathers. In order to achieve ideal water conditions, swimming pool water requires testing on a daily and sometimes hourly basis for disinfection of residuals and maintaining pH levels. Equally important, calcium hardness and alkalinity levels should be monitored weekly to ensure the pool water is well balanced, thus to avoid corrosion and scale formation. 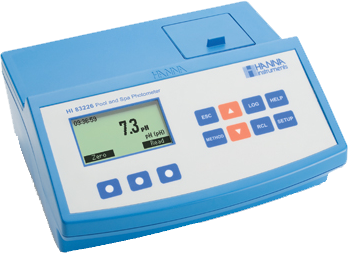 HI 83226 is a multiparameter bench meter that measures nine parameters essential for advanced pool and spa water analysis. The optical system of HI 83226 is based on special subminiature tungsten lamps and narrow-band interference filters to guarantee both high performance and reliable results. HI 83226 has a powerful interactive user support that assists the user during the analysis process. A full tutorial is available in the Setup Menu, and the Help Menu provides assistance for every step in the measurement process. 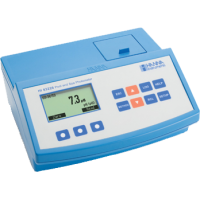 This meter can be connected to a PC via a USB cable, where the data can be managed with optional HI 92000 Windows® compatible software.